Snowshoeing can be dangerous and you must prepare in advance by dressing for the elements and bringing the right gear in case of an emergency. You must remember that you are going outdoors in a cold environment and whenever there is cold, there is always a chance of hypothermia. When you take your first step on your snowshoes, you should always ask the same question to yourself. "Do I have enough food and protection to stay overnight if I injure myself?" You never know what is going to happen on a bright, sunny, calm day. It's better to carry a little extra and be safe. When I am done for the day, I always replace anything I've used for that day in my fanny pack. That way, whenever I snowshoe again, I always know that I have the necessary gear in my fanny pack. The challenge in dressing for snowshoeing is to be comfortable as well as warm. Snowshoeing is very aerobic and you tend to sweat. The layering of your clothing is essential because you can vary from being both hot or cold during the day. Your first layer should be breathable and lightweight so that the moisture is pulled away from your skin. Your second layer creates the protection from the temperature outside. This layer can be a combination of fleece, vest and a hiking top. Your final layer should protect you from the rain, wind or wet snow. The same process should be considered for your feet. You should start with a thin, lightweight liner sock to wick away the moisture from your feet. The next layer should be your hiking sock. Always waterproof your boots before heading out into the snow as warm, dry boots are very important. Try to wear boots that provide ankle support and are flexible enough to allow mobility of your feet. A good pair of gaiters worn over your boots and pants will add to your snowshoeing comfort by keeping the snow and moisture out of your pants and boots. Your can either wear blue jeans, fleece or a wind stopper pants depending on the temperature and the wind. Mittens are always warmer than gloves. But if you need the ability to use your fingers, then wear a pair of waterproof or wind stopper gloves. If you are too hot, take some of your extra layers off. If you are too cool, put the extra layers back on. Always maintain a comfort level and "Drink before you're thirsty and eat before you're hungry." 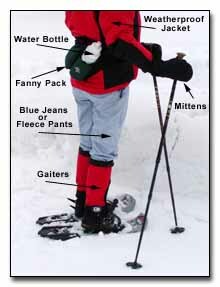 Always be prepared by deciding on what to wear snowshoeing before you start your hike for the day.